Printing Services, delivered to the highest standard. 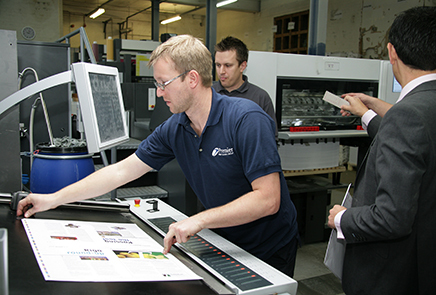 At Premier Print Group we understand the importance of delivering a quality print job, on time and to specification. Our expert team has 30 years’ experience in the printing business and understand the unique requirements of each job, whether it be short-run magazine printing, books or commercial literature. We work fast and can turn around short print and mail out jobs within 24 hours when required. We know that sometimes small changes need to be made to your documents after you’ve sent them to print and our in-house designer can make these artwork changes for you. We can also design magazine layouts, working to an existing template. Our design service supports files created in Quark, InDesign and Pagemaker. We work on all styles of publications, such as magazines, newsletters, journals, booklets, annual reports, brochures, leaflets, advertisements etc. Using the very latest technology, we can ensure your short run magazine printing requirements are met in an efficient and cost effective way. Find out more about our magazine printing services and brochure printing services here. Enhance the finish with one of our gloss or silk coatings or try our “Soft Touch” coating with its smooth, tactile finish to enhance the quality feel of your company. Find out more about our coating options here. Because we print and mail under one roof, we can save time, money (and the environment), by avoiding sending printed jobs to an outside mailing house. Once we have printed your magazine or booklet, we are also able to offer you the full mailing and fulfilment package, to save you time, money and effort. Once your print job has rolled off the press, we can provide free delivery to anywhere in the UK via FedEx, and a range of direct mail services to save you time and streamline the delivery process. We have recently invested in a new printing press that utilises the latest computer plate systems and a fully automated register which can scan sheets and make adjustments to 100th of a millimetre. Delivered in November 2012, this leading technology calibrates to a finer degree, providing the highest levels of colour accuracy and will enable us to print greater quantities even faster. Find out more about our existing equipment and capabilities. In addition to our printing services, Premier Print Group also offers direct mail services to provide an end-to-end solution.